Much attention has been paid to how electric and hybrid cars are making motorways more green but now the advertising billboards are also giving themselves a greener look. Ricoh Europe, an eco-friendly office solutions company in Europe thinks so. They recently launched an ‘eco-board’ powered 100 percent by wind and solar power. The first of its kind in Europe, Ricoh uses five individual wind turbines atop the eco-board and 96 solar panels below it to illuminate the sign only when enough power has been generated. 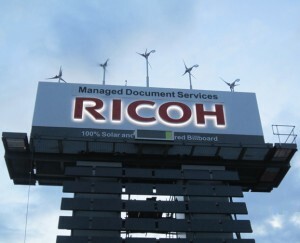 Besides reducing their carbon footprint, Ricoh hopes their eco-board serves as a conscious reminder for all those who see it. “Our ethos is to go beyond simply meeting regulatory requirements relating to sustainability by proactively promoting environmentally responsible practices in our own business and for our customers. The launch of the eco-board takes us one step further by reminding wider public audiences to act in a sustainable way and think beyond the obvious when it comes to protecting natural resources,” Steve Saito, Chairman and CEO of Ricoh Europe said in a press release. To get their message out, Ricoh placed their eco-board on one of Europe’s busiest thoroughfares: London’s M4 motorway that runs from the heart of the city to Heathrow airport. This isn’t the company’s first foray into alternative-energy billboards. Last year, Ricoh launched a solar-powered billboard in New York City’s Time’s Square. Previous Bid to Block Human Embryonic Stem Cell Research Fails! Next Spacecraft For Jupiter On its Way!